Our production began slowly, with the purchase of a Tamworth sow and the purpose of filling our own freezer with a supply of healthy tasty pork. 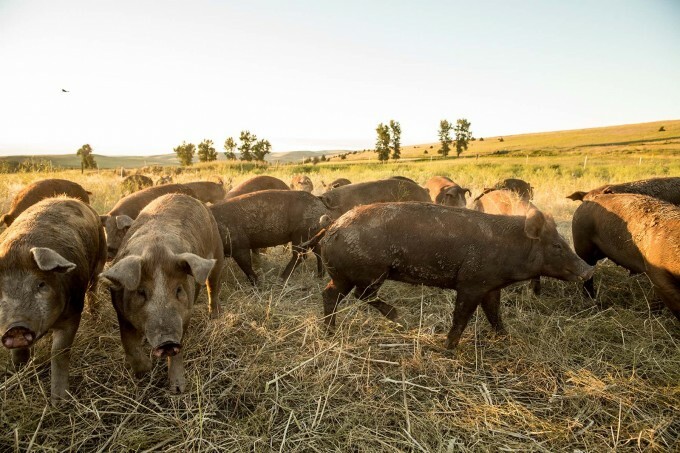 We were extremely pleased with the first litter (sired by Andy, a Hereford boar) and with our discovery that the pigs could benefit the ranch’s prairies by rooting out invasive weeds and allowing native grasses the chance to re-establish themselves. After we move the pigs to fresh grazing areas, we replant the loosened soil with native grasses, and the pigs go to work on a new area. The traditional method for making carnitas (“little meats”) involves simmering chunks of seasoned pork in hot lard. This method uses a slow cooker, a spice-rubbed bone-in (or boneless] pork shoulder, and the juice of an orange and some onions for flavor and moisture. Not only is this recipe better for you, it’s a snap to put together and every bit as delicious. Reheating the shredded pork under the broiler means the little meats are as crispy as the carnitas at your favorite taqueria. Rinse and dry the pork shoulder. Season liberally with salt and pepper. Combine the cumin, oregano, cayenne pepper and smoked paprika in a small bowl and rub all over the pork. Place the pork in the slow cooker and add the cinnamon stick, onion, garlic and chipotle peppers. Squeeze the juice from the orange halves over the meat and add the halves to the slow cooker. Squeeze the juice from the lime. Cover and cook on low for 8 to 10 hours, or until the meat is tender, falling off the bone and pulls apart easily with a fork. Remove the pork from the slow cooker to a large bowl until it is cool enough to handle, then remove the bone, and shred the meat with two forks. Skim the fat from the leftover juices and keep it for reheating the meat. To serve, preheat the oven to 450 degrees. Line two sheets with foil and covered them with an even layer of shredded pork. Drizzle the meat with some of the juices and fat, and heat until crispy, about 5 minutes. For carnitas tacos, reheat the meat and serve in warm tortillas with accompaniments like pickled red onions, cilantro, lime wedges, cabbage, jalapenos, radishes, etc.